CIMB cross-border network has over 3,750 CIMB ATMs which can serve you throughout Malaysia, Singapore, Indonesia, Cambodia and Thailand. CIMB overseas withdrawal is FREE of charge and it can be very useful if you’re traveling into the 5 ASEAN countries they have services in. 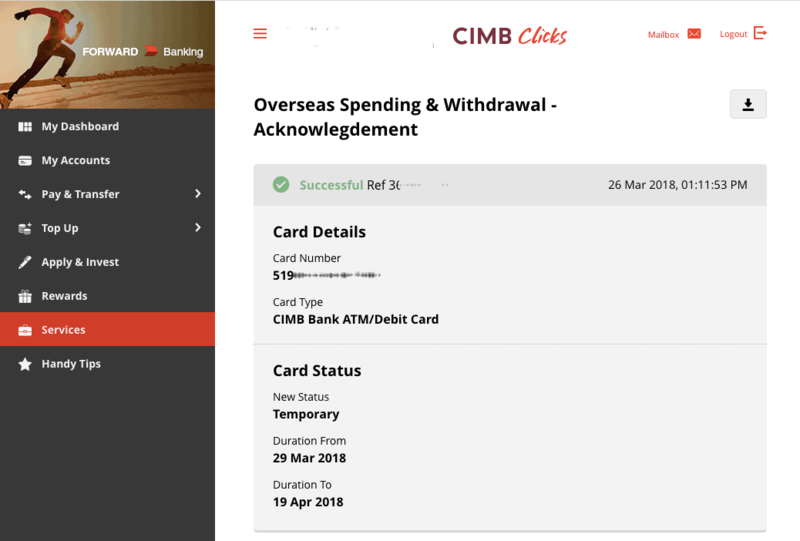 The easiest way to activate overseas usage is via CIMB Clicks online and the steps are pretty straightforward. Note: The steps outlined here are for CIMB Clicks Malaysia but the principle applies to all ASEAN CIMB Clicks. First of all, you will need to ensure that your mobile phone is registered with CIMB and it is capable to receive TAC code via SMS. 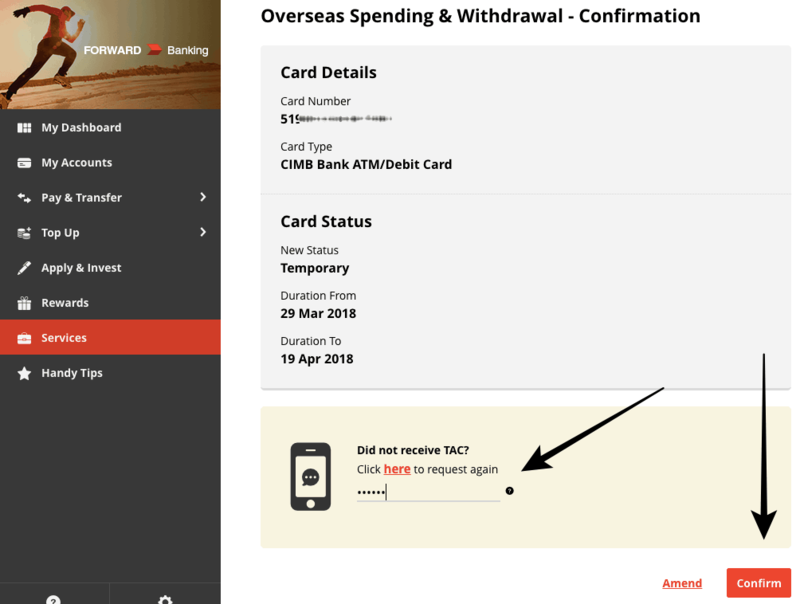 Next, go to CIMB Clicks and login into your account. Once you’ve logged into your account, click on Services at the top left followed by Overseas Spends & Withdrawal. Next, select your CIMB Bank ATM / Debit Card that you wish to activate. Now, you should be given options to set the overseas withdrawal. You can set status to Temporary or Permanent and also the Duration. If you’re frequent traveler, you can set this option to permanent. Click on Submit once you’ve set the Status. To confirm on the changes you’ve made, you will need to enter a 6 digit TAC code which will be send to your registered mobile number. Enter the TAC code and click on Confirm. Once it indicates Successful, you can now withdraw cash at any CIMB ATMs ASEAN countries they have services in. If you want to disable this service, simply follow the steps above again and set the Status to Deactivate. If you’re withdrawing from the CIMB ATM itself, there are no charges. i.e. It’s FREE. However, if you use your CIMB card on a non CIMB ATM, you will be charged RM8.48 per transaction for MEPS and RM10.60 per transaction for Mastercard. For detailed charges and fee, you can refer here. The exchange rates are competitive and there is no commission charged to customers. To check on their exchange rates, click here. 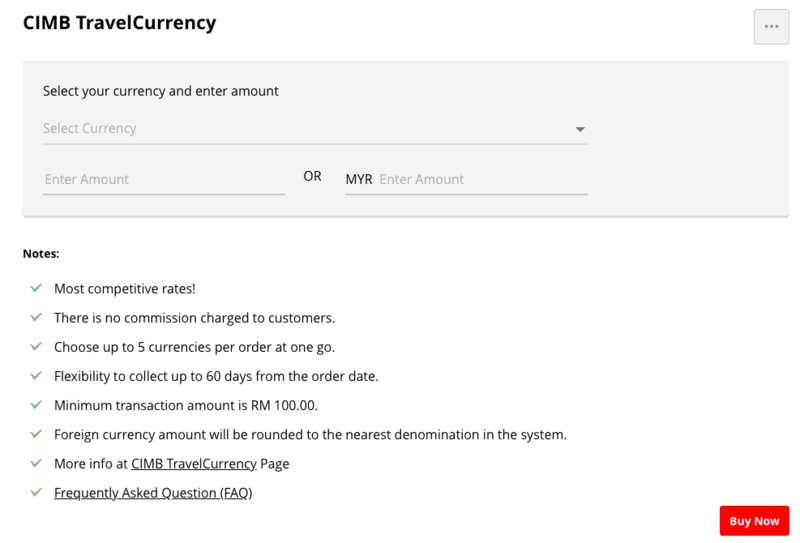 At the CIMB currency exchange page, select your currency and enter your desired amount. You will be able to see the current rates and you don’t have to click on Buy Now, just use this information as a guideline. 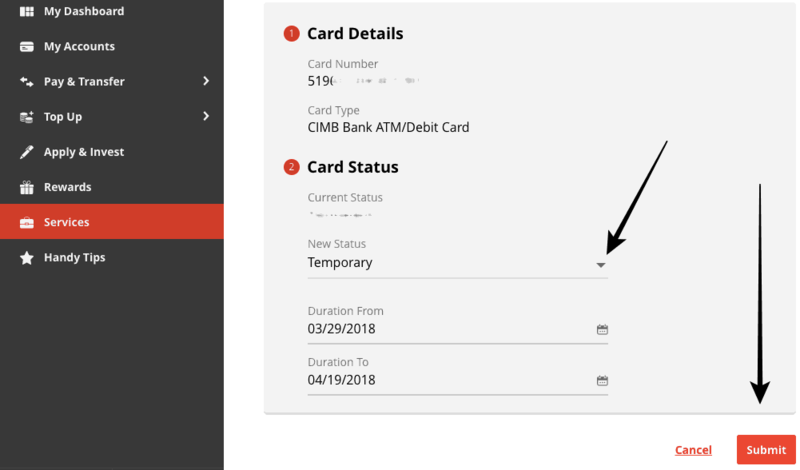 Can the CIMB Debit Mastercard be used overseas for shopping / transaction? Yes. However, before using your CIMB Debit Mastercard overseas transaction, please activate the overseas usage function via ATM at any one of their branches or get hold of their Contact Centre at +60 3-6204 7788. You will be using the same 6-digit PIN for your overseas usage. For those countries that have not yet migrated to PIN will still require you to sign for verification in order to use your CIMB Debit Mastercard for payment. If this is not possible, or the Retailer refuses to allow signature, then you must opt for a different payment method.